We spent Waitangi Day weekend in the capital city. Wellington is a great city, with beautiful botanical gardens, a lively waterfront and lots of public art. The weather is often wet and windy but we were very fortunate to have a whole weekend of sunshine. There wasn’t much time to stop and sketch but I did manage this one view from the 19th floor of the Travelodge Hotel! What a lovely place and I love your peaceful depiction of it. I love how the blues stand out and really bring focus to the water. Are you based in NZ? Thanks! I’m living and working here (in Auckland) for a year, returning to the UK in August. that’s awesome! are you traveling the country too or just doing like a working holiday (I have been tempted to do a working holiday myself). Mostly working but travelling during weeks off and at weekends! have you gotten to see the glaciers and fjords down in the southern island? I have been dying to go there! Yes, we’ve been there a couple of times, to Fox Glacier and to Milford Sound. Definitely go! 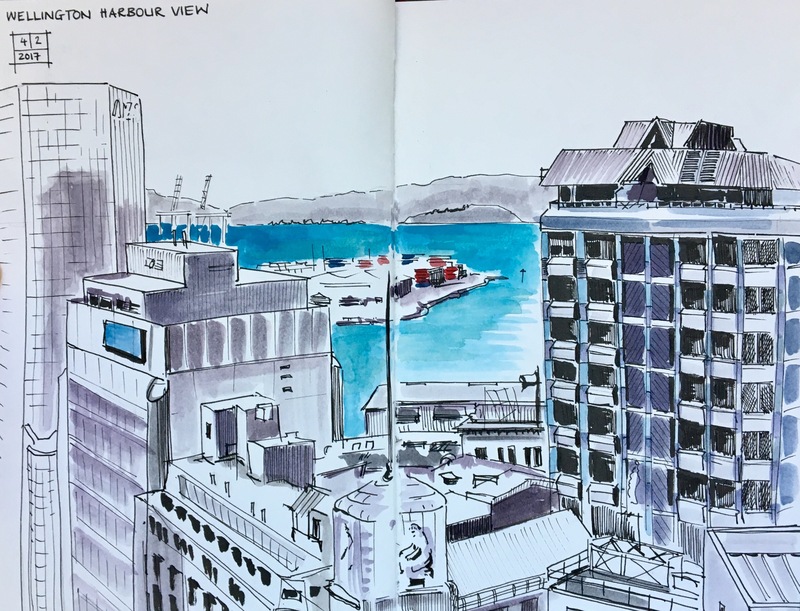 Pingback: Wellington Harbour — Tabitha’s sketchbook — С любовью к людям!